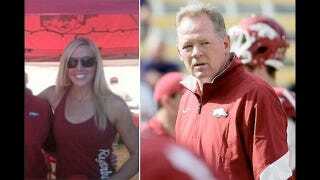 The police report for Arkansas coach Bobby Petrino's motorcycle crash on Sunday shows he had a previously unmentioned passenger: Jessica Dorrell, recently named student-athlete development coordinator for football. Operator Petrino was traveling west on his motorcycle in the westbound lane of Arkansas State Highway 16 with passenger Dorrell riding on the back. For an unknown reason, [Petrino] traveled across the westbound fog line as he was applying the brakes. After traveling off the north side of the roadway the rear of [Petrino's motorcycle] began rotating counterclockwise causing [Petrino] to lay over onto its left side. While on its left side, [Petrino's motorcycle] slid northwest through a grassy road ditch, striking a pile of dirt and tree limbs in the north road ditch. I spoke with passenger Dorrell to see what information, if any, she could share regarding the cause of the collision. Passenger Dorrell state[d] she did not know what caused this accident. Petrino and Dorrell did not stick around the accident scene. They were picked up by two people (Petrino said Tuesday they were random passersby), who dropped Dorrell off at her car, before police arrived. Dorrell was a four-time letterwinner in volleyball , and progressed to handling fundraising duties for the Razorback Foundation. Just last week she was named a development coordinator for the football team, and will "handle on-campus recruiting and work with incoming players on eligibility issues." It also seems she's supposed to get married in June. Her fiancé works for the swim team. Arkansas's initial statement on Monday morning said the accident "involved no other individuals." Petrino said yesterday that he had spent Sunday, the day of the crash, with his wife at an area lake.